The staff at Whitwell Memorial Funeral Home is strongly committed to helping your family prepare and plan personalized, meaningful funerals and memorials...and to provide service and merchandise options people can afford. Deciding how you would like to remember and honor your loved one is really a personal choice. With so many options available, you can customize a fitting tribute that reflects the life and passions of your loved one. 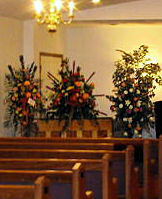 Funerals and memorial services can be as varied as the individual they represent. We realize each family has its own unique needs, which is why your satisfaction is our goal.